Why don't my sleep medications help me sleep anymore, or help me go to sleep when I take them? Is there anything I can use to help me sleep better without causing side effects that impact my waking life? Is there anything besides drugs that I can use to help me to sleep? "Is There Anything that Can Help Me Sleep?" If you are asking yourself this question, you are not alone. 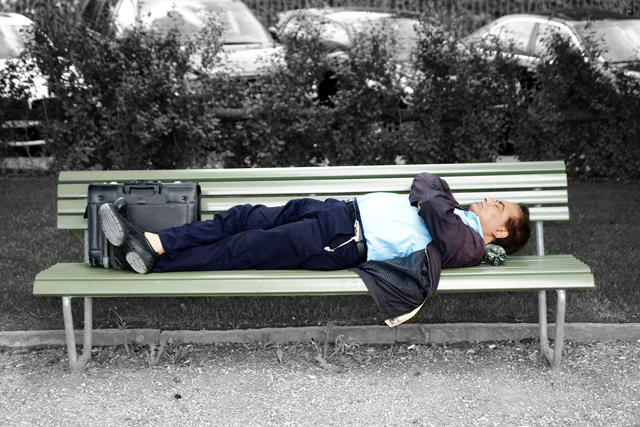 The Centers for Disease Control and Prevention considers insufficient sleep to be a public heath epidemic. The CDC estimates that between 50 and 70 million people are asking, "Is there anything that can help me sleep better?" on a nightly basis. Understanding the root causes of sleep problems can be difficult. Indeed, many have already tried a host of sleep remedies prescribed by traditional doctors and are lying awake at night wondering, "Are there any alternative therapies that can help me sleep?" Many have found that certain drug prescriptions help them sleep at night, but find that the side effects have a dramatic impact on their waking life. Oftentimes, when a doctor hears a patient say, "I need something to help me sleep at night," they immediately turn to the failsafe of modern western medicine — drugs. People are discovering more and more that there are limitations to the traditional therapies that are prescribed by Western medicine. The same is true for the epidemic of sleep deprivation. It's not that western medicine doesn't work; it's just that everyone's metabolism is different and sometimes alternatives are needed to find answers to sleep issues. This is really the crux of the matter. While pharmaceutical drugs help some people sleep at night, the effects can be temporary. For others, drugs might not help them sleep at all. This, compounded with unwanted side effects, can make a person's sleep problem worsen over time. The reason for this vicious cycle is simple. Drugs only treat the symptoms of poor sleep, not the root cause. For people who have been taking drugs that help them sleep at night for many years, it can feel like there is no way out. You might fall into this category. If you find yourself feeling like your sleep patterns have come unraveled and are begging for someone to "help me sleep at night" it might be time to consider an option that can help you restore a healthy, natural sleep pattern. This is the job of the brain, and is accomplished when there is a natural rhythm of neurological patterns established through a chemical balance. When this balance is working as it should, sleep is a natural process. When it ceases to function normally, you lie awake in bed wondering, "Should I take something to help me sleep?" Falling out of a healthy sleep pattern happens slowly. Western medicine often relies on "taking something" to help restore balance, but the truth is that when a drug is introduced into the body it only masks the real problem and throws balance further out of whack. This is the reason drugs often work well for a time, but sleep problems later reappear worse than they were initially. Because the root of the sleeping problem has not been addressed, the drug therapy proves insufficient. This is because the natural rhythms and chemistry of the brain have been interrupted and replaced with whatever drug was introduced into that chemistry. The chemicals act as a crutch for the brain, which no longer can operate to its fullest capacity. Subsequently dosages have to be increased when sleep again becomes problematic. However, dosages have limits where they become unsafe, when you reach this point you are back at square-one, only far worse off than you were to begin with. All of which begs the question, "Is there anything besides drugs that can help me to sleep?" The CES Ultra is a medical device for the treatment of stress and stress-related disorders. It employs gentle electrical stimulation to the head (cranial electrical stimulation) to help normalize brain functioning. Try the CES Ultra to sleep better. If you have ever suffered from insomnia, you know how debilitating this epidemic can be. What you may not realize is that sleep deprivation can be life threatening. The National Department of Transportation estimates drowsy driving to be responsible for 1,550 fatalities and 40,000 nonfatal injuries annually in the United States. Sleeplessness is more than just a hassle; it is a life threatening illness that demands a solution that really works. Millions of people have searched tirelessly for a treatment that works, only to become discouraged by traditional therapies that offer no real cure, and only seek to disguise the symptoms. If you are asking the question, "Is there anything ELSE that can help me to sleep naturally, without debilitating side effects?" 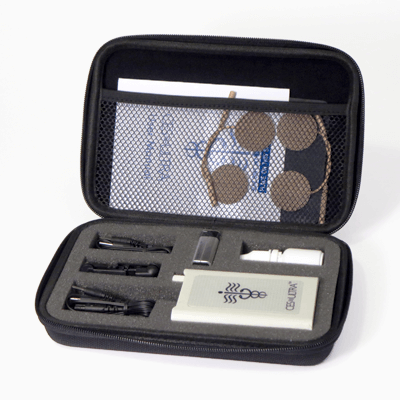 then you should consider Cranial Electro Therapy Stimulation (CES). CES uses the natural processes of the brain to reset your sleep clock, thus reestablishing your natural sleeping rhythms. CES has no known side effects. CES helps the brain to function naturally without introducing a chemical cocktail. CES relieves the symptoms caused by insomnia, anxiety, and depression. CES uses a gentle electrical impulse applied to the ear lobes that is anatomically transferred to the brain. The unit is handheld, and is designed to be used at home. Best of all, CES is far less expensive than the ongoing costs of drug prescriptions. The U.S. Food and Drug Administration allows the medical claims of "insomnia, anxiety, and depression" for CES use. Anxiety and depression are two common triggers of insomnia or sleep problems in general. Depression and anxiety will begin to cause sleep problems in people who haven't previously experienced difficulties with sleep. A vicious cycle will often begin to take place in individuals whereby: the more anxious a person becomes the more they suffer from sleep disorders; the more one suffers from sleep disorder the more anxious one becomes, and on and on. The same is true of those who suffer from depression. By allowing the brain to "reset" to its normal rhythms, CES creates a new and healthy habit for your sleep patterns. Studies show that within two weeks of daily CES use you will see a substantial decline in your sleep problems. Stop asking yourself, "Is there anything that can help me sleep at night?" Contact us today and find out how healthy sleep can restore your health, and bring you back to your full potential. "I suffered from insomnia for 15 years. I had tried everything I could find to make myself sleep better. Nothing that my doctors were doing was able to help me. Then I discovered the CES Ultra. I was miserable, and began suffering from depression. After daily use for 11 days I went from sleeping an hour or 2 at a time to sleeping 6 hours straight. Within the first month of use I was sleeping through the night. The CES Ultra didn't only help me sleep, I tell my friends: It saved my life!" "I don't think that I have slept through the night properly since my daughter was born nearly 17 years ago. For me it was a challenge to fall asleep, and if I managed to do that, then I would still keep waking up every couple of hours or so. My sleep cycles were totally out of whack and were destroying my every waking moment. This situation had gone on for so long, that I was beginning to believe that nothing could change it ... and the only help I got from my doctor ... was a prescription for more sleeping pills. A friend suggested that I try your CES machine, and after only a couple of weeks of daily use, I began to notice that I was waking up less often and sleeping much better through the night. The best part about sleeping longer is that when I got up, I actually felt well rested and refreshed. Truthfully I haven't felt this good for years. I so glad I trusted my instincts on this one. It worked out to be one of the best things I have ever done for myself."